Patriot Ordinance Factory Renegade+ ($1899.99) When we decided to make a direct impingement rifle, it couldn’t be another “me-too” carbine. The Renegade + embodies everything a direct impingement AR-15 can be. With improvements such as our roller cam pin and patented heat sink barrel nut, these upgrades go well above mere aesthetics often found in rifles today. Put simply, the Renegade + addresses all of the weak points of the direct impingement system. The Dictator 9-position adjustable gas block gives you ultimate control of your rifle, whether tuning for ammo load or suppressor use. The straight gas tube eliminates heat build up from the weak points of standard gas tubes. And the roller cam pin ensures a smooth and more reliable relationship with the upper receiver. The Renegade+ is built off of our Gen 4 billet lower receiver and Ultimate Bolt Carrier Group. This receiver is completely ambidextrous and includes our flat 3.5 lb match grade trigger with KNS Precision anti-walk pins. Competition ready right out of the box. The magic in the upper receiver is held within our Ultimate Bolt Carrier Group which is high phosphate nickel coated for maximum protection & reliability and features an integrated gas key (no screws required). Like the Renegade, the Renegade + comes with our M-LOK compatible Renegade rail, covering the 16.5” nitride heat treated barrel. The Crimson Trace CWL-200 ($79.99) is a powerful rail-attached tactical light for Picatinny rail-equipped long guns and provides up to 900 Lumens of white light.Experience the power that effective illumination can provide. 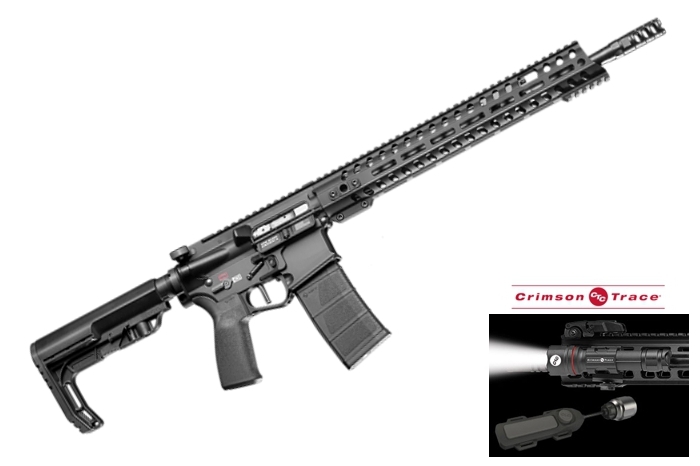 Introducing Crimson Trace Tactical Lights, a best-in-class family of tactical lighting products for rail-adapted long guns, backed by the Crimson Trace reputation you trust. MAINTENANCE: Standard receiver/carrier group field strip procedures.